I have discussed probate fees, now known in Ontario as the Estate Administration Tax (“EAT”) in several blogs. Probate Fee Planning is now a cottage industry in Canada, as Canadians strive to minimize this provincially mandated tax. The EAT (what an appropriate acronym) is paid on the value of a deceased person’s estate when their executor(s) apply for a certificate of appointment of estate trustee (better known as “letters of probate”). Anyone who has had the unfortunate experience of being an executor can attest that without these letters of probate, you have no authority and the various financial institutions will not even to talk to you. In Ontario, upon applying for the certificate of appointment, the executor must provide a list of the deceased’s assets and their fair market value and pay the EAT on those assets. In Ontario these fees are $250 on the first $50,000 and $15 per $1,000 of assets thereafter. Thus, the EAT on $100,000 would be $1,000 and on an estate of $1,000,000, the fees would be $14,500 . Although executors spend hours upon hours compiling the list of assets for the application to get the certificate, the Ontario government often accepts the tax paid without question and often does not follow up or audit the list and valuation of the deceased’s assets. I recently attended the Ontario Tax Conference where there was some discussion about changes to the EAT legislation. 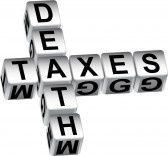 These changes are summed up in this newsletter published by the law firm Cassels Brock titled “Taxed to Death: Heightened Audit for Ontario Estate Administration Tax”. In this newsletter, the authors Ambie K. Edgar-Chana and Lindsay Ann Histrop discuss the audit and verification powers, as well as assessment powers, that the Ontario Ministry of Revenue will have beginning January 1, 2013. Ontario estate auditors will now have four years from the date the EAT is payable to assess or reassess the tax. As a consequence of the increase in verification powers, the valuation of assets disclosed in the application will be subject to far greater scrutiny. Executor(s) will be required to assist the Ontario Ministry of Revenue and answer questions regarding the valuation of the estate’s assets. Executors will have to be extremely diligent in obtaining and documenting how they came to the valuation of assets reported on the application. In addition, beginning in 2013, executors will have to be extremely cautious in distributing assets before the end of the four year period, as they could be held liable for any additional probate taxes owing. The heightened audit requirements in 2013 will likely result in increased liability for executors and will likely be a catalyst for even more probate planning to ensure the value of the estate is minimized for the EAT. Good to know that for once Quebec has lower taxes than Ontario: there are no probate fees in Quebec. My husband died on Nov. 29 in Ontario. We have three grown children. All assets are in his name only. It is a nightmare. Anon, I am sorry for your loss. Things are overwhelming initially.Hopefully for your sake you are the main beneficiary in the will which will make things a little smoother to get organized. I am a non resident Canadian citizen now living in the United States (also now a US citizen). What happens when I receive an inheritance (under a million) from my parents in Ontario and that money is transferred to my US account. Is there any estate tax to be settled in Ontario and are their any estate taxes to be paid in the U.S. because the money is coming from Canada. I know there is no U.S. federal estate tax under 5 million. I cannot comment on the US gift tax or estate tax as I do not practice US tax. As for Canada, there are no estate taxes on your inheritance, although your parent(s) estate may have to pay probate and your last surviving parent may or may not owe income taxes on their final terminal tax return depending upon the assets they hold.